Longmont, CO; Lowell, MA; and Port Townsend, WA to start Recovery Cafés to respond to the addiction crisis and mental health crisis damaging their local communities. 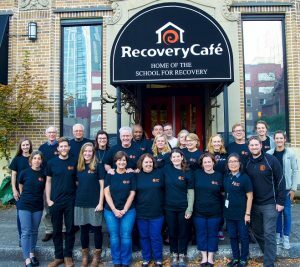 Seattle, WA: In October, the Recovery Café Network launched its fourth cohort of member organizations opening Recovery Cafés in Longmont, CO; Lowell, MA and Port Townsend, WA to respond to the addiction epidemic and mental health crisis facing their cities. Over a two-day session, taking place from October 18-19 in Seattle, the new Café leaders learned about the Recovery Café model’s approach to provide individuals the support and stability we each need to thrive, especially individuals suffering from addiction, homelessness and other mental health challenges. Each Café returned home excited to start communities of longer-term recovery peer support. “The Recovery Café model offers hope: Hope for these three groups that are undertaking this vision for the benefit of their community; hope for the individuals that will come into these vibrant Cafés; and hope for our world that communities of support are the pathway we each need to thrive,” said David Uhl, Recovery Café Network Director. In the lead up to the Cohort Launch, the group starting a Recovery Café in Lowell, MA received coverage from a local TV Station. Not only was it exciting to hear them sharing their vision, but it included a picture of the original Recovery Café space in Belltown. See the video here. “We are in awe of the devotion these three organizations have for their communities. Across our nation the realization of what the Recovery Café model provides is growing. While the world can often feel so heavy the light is hard to see, this Cohort shines brightly, truly kindled by the hope for their communities. It’s a gift for us to support them on their journey,” said Ashley Propes, Recovery Café Network Coordinator. This two-day training begins a two year journey where each group is an Emerging Member of the Network. The Recovery Café Network team walks alongside each Café and supports them as they open their doors and welcome individuals to become Members. At the end of two years, they will be evaluated and graduate from Emerging Members to Full Members.